Whenever you open some kind of how-to manual, especially the one regarding manual skills, there’s always this huge chapter on safety – or at least a short note “be careful or you die”. It’s weird that for most people all this safety stuff is a pain in the… bottom, but in the end, sticking to the safety rules make sure you live to make another flute :). Safety is very important when making anything with your hands – after all, we all prefer to keep our hands till retirement. Before I even explain how flutes can be crafted, I have to explain the rules regarding your personal safety. 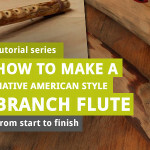 Flutemaking is awesome! But learning these safety things may be quite boring – it usually is. Whenever I learn something new, I hate the part when I have to start with the safety and theory. But over time I’ve learned that learning these things, even if it’s boring, can actually save you a lot of trouble and problems (and even save some money on your medical insurance). Thus, please don’t skip this article. It’s not that long, after all. A note: the amount of dangers in the process of crafting flutes requires you to be a responsible adult. If you’re not an adult (or responsible for that matter), please, seek additional suppervision. 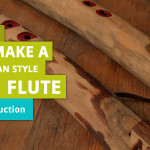 When making flutes, you may get cuts, burns, you may burn your home or lose your finger or an entire hand – these are not nice things – please be very, very careful! And when you get hurt, while we don’t want the world full of hypochondriacs, if the wound looks very dangerous, always seek medical help. Safety goes first. 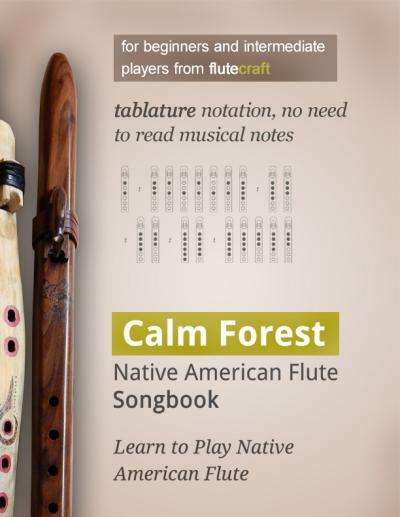 When you craft wooden flutes, there are many dangers that you need to be aware of. You work with wood, and sometimes with other substances – alcohol, oils, industrial gas. And you use tools of different sort, most of which are dangerous – knifes, saws, different blades, electrical drills and saws, heated rods and so on. Cuts – crafting Native American style flutes requires the use of saws and knives, or even electrical saws that can cut your hand clean off! Such tools may cause some very serious and deep cuts. Even when you use just the hand tools, they’re not really less dangerous than power tools, they can still harm you. Remember that while knifes can cut you, a power saw can cut off your entire hand – be very, very careful! Burns – crafting flutes require the use of fire (sometimes) and high temperatures (quite often). For example, burning rods or electric burning tools must be heated up (up to few hundreds Celcius degrees) and they may cause serious burns. While not every flutemaker uses heated rods or burning tools, those of you who will prefer this way of tuning the flute will have to be careful. Fire hazard – because fire (and sometimes alcohol and oils) is in use, there is a chance of fire hazard in your workshop, too. Blades of different sort can break and hit you with great strength. Especially craft knives are easy to break because of the stress put upon the thin metal blade. Don’t put too much stress upon the knife, know the blade’s limit and use the best possible types of blades – don’t use cheap stuff, because usually it comes with lower durability. Also, remember to keep the distance from the knife’s blade – the blade itself, once broken, can fly any direction, and can even get under your safety glasses, right into your eye. A smoke and dust is generated while working with wood – dust when sanding, and smoke when burning. Both may cause lung and eye irritation. Wear a safety mask and safety glasses. When you decorate flutes with crushed stones, usually epoxy glue is in use – its fumes are toxic. Always work in a room with good ventilation, or work outside. 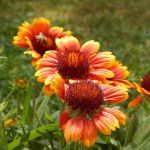 Oils, alcohol and resins may cause allergic reactions and skin irritation. Make sure (for example, do some medical tests under medical supervision) that you’re not allergic to any material which you’re using for conservation and preservance of the wooden flute. For example, the tea tree essential oils are used from time to time to mix with bee wax to create a wood polish, and to sterilize the mouthpiece – yet some people may get an allergic reaction to this essential oil. When using an industrial gas bottle to heat up a burning rod, it’s very important to stick to the safety rules written on the gas bottle. If you fail to stick to these rules, the bottle may blow up – with you and your entire home included. Actually, this goes for every single tool and substance you’re using in your workshop. Always read the instructions and labels – really, always! The funny thing (well, not so funny when you get hurt) is that most accidents happen because people assume they already know everything there is to know about safety, the substance, or the tool they’re using. Assumptions are dangerous – here’s a Zen exercise: never lose the awareness of your workshop. Always be present, know what you’re doing. It’s interesting that handtools are more dangerous than power tools simply because people assume handtools are less dangerous because they’re slower and weaker. Below you see some basic rules regarding your personal safety. Remember about the Murphy’s Law – if things can go wrong, assume that they will. Be prepared for everything. 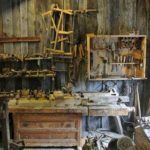 A vice, holders and clamps have been invented for a reason – some things can be made while holding the flute or piece of wood in your hands, but most things, like cutting or carving or chiseling is much safer when you place the wood in the vice or clamp it down. Wear safety glasses and gloves – when you use burning rods, wear safety gloves. When using knives and blades, be very careful! And almost all the time, wear safety glassess. Also, when sanding things or burning things, wear a protection mask covering your mouth and nose. Watch your fingers – when using any type of tool, watch your fingers. This goes for different types of burning rods, flame sources, knifes, blades and power saws that can cut your hand clean off. We don’t want this to happen, really. Get the first aid kit – Also, learn as much as possible about first aid rules. Learn how to stop the bleeding, and how to take care of other types of wounds. Attend a class in first aid if possible and necessary. When I was just starting out with my flutemaking journey, I couldn’t understand what all the flutemakers talk about when it comes to their hands full of scars. Well, now I do understand. Get an extinguisher – When an extinguisher is present already, make sure you know how to use it. Read the instructions (they’re usually written on the extinguisher itself), or even ask your local firefigthers to give you some practical lessons. 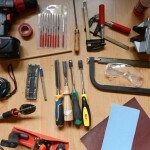 Know your tools – the craftsman is only as good as his knowledge of the tools is. You can have a lot of very expensive tools, which become useless if you don’t know how to use them. At the same time, you can have a lot of simple and cheap tools which you can use to create perfect art only because you know how to use them. 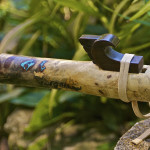 Read and learn about the tools and the material – read books, manuals and articles, even if the title sounds ridiculous, like “how to use a hammer without killing yourself”. Believe it or not, sometimes such articles or manuals provide you with these little nasty tips that can actually save you from damaging your own body. Sometimes, gentle work is required. But some other time you need to add some pressure. For example, when you drill holes or push the wood through the saw, or you use a handsaw to cut through the wood, you need to push with your muscles and your body. When you do this, always make sure you stand hard on the ground so that you won’t lose balance and trip/fall towards the blades if something goes wrong. 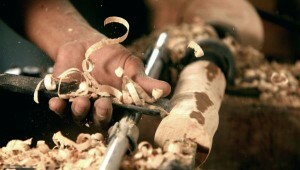 When you use chisels and knives, you always move the blade outwards, away from yourself – never towards yourself. Store your tools and materials properly – you don’t have to create a perfect storage space, but a safe space. And safe in this case usually means: make sure nothing will fall down on your head or your toes, and make sure the shelves won’t trip. And also, make sure your woodworking bench or desk won’t break under the stress. Be careful with sharp wood edges – based on my own experience, a bamboo makes very sharp knives :). If it happens that you work with a sharp wood edge and your hand slips fast, the wood itself may create a deep cut. YouTube is your friend – go there, and start watching woodworking videos and tutorials. There’s a lot of them on YouTube. You know, you can learn a lot just by watching how other people use their tools by making a cabinet or a table or a photo frame. Basically, what you can see in this article is a one big warning against hurting yourself. Truly, while making flutes may sound an easy thing to do, and safe thing to do, it’s not always the case. When you work with power tools or any type of blade or heated rod, you never know what might happen. Thus, prepare for the worse, and hope for the best. When I first learned how to make earth plasters, my foreman taught me that the most primary safety rule in any manual work is the rule that says: clean your damn workspace! Really – at the end of the workday, clean your workspace. It may be a pain in the bottom type of work, but it will save you a lot of troubles, especially when you are working with wood. At the end of the workday, always clean the desk, floor, shelves – everything, actually. Clean your tools, as well. Dirt and dust on tools may shorten their lifespan. Too much wood dust or wood shavings may prove to be a fire hazard. Cluttered tools may be dangerous when you trip over them and, let’s say, fall down on a power saw, getting your hand cut off in the process. Or falling down on a running drill and killing yourself in result. 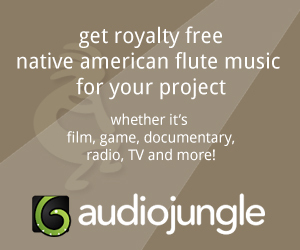 Does this sound brutal? Well, basically whenever someone talks about safety rules at work, that person should use brutal examples. It’s the only way people remember the safety rules. Really, clean your workspace or you may die! In the end, let’s face it – you will get scratches, cuts and bruises. You will bleed, too and you will get yourself a couple of scars. Otherwise, you’re not a woodworker. The whole point of being careful and keeping safety in mind is to make sure the scratches, cuts and bruises and a little bit of blood and scars is all you get. What kind of safety rules and tips would you like to add to this list? Share your thoughts in the comments below, please.